Faith Bronson leads a privileged life as the daughter of Joe Huston, the senior senator from Virginia, the wife of a conservative lobbyist whose views are compatible with her father’s family-values constituents, and the mother of two healthy, intelligent children, a son and a daughter. Ten days before Christmas, she sets out to surprise her husband David at the family’s West Virginia retreat, but Faith is the one who is surprised when she finds her husband of fifteen years in the arms of his male lover, Abraham Stein, a liberal journalist. To the dismay of everyone concerned, she is not the only one who discovers the lovers. A suspicious colleague of Stein’s has followed the two men to the cottage. Faith’s private discovery becomes public humiliation as a media frenzy insures her husband’s sexual preference is breaking news. Predictably, David loses his job with Promise the Children, the organization for whom he works. By summer, Faith’s marriage has been legally ended, the custom-designed home where she and David had reared their children has been sold, and for the first time in her life, money, or the lack, is a major concern. Faith finds sanctuary in a house on Prospect Street, a Georgetown row house that has been in her mother’s family for generations. The house, which has been neglected and damaged by tenants is in dire need of renovation. The symbolism of the house in need of attention and care and Faith, a shattered woman, is clear. Pavel Quinn, a neighbor who has successfully restored his own Georgetown house, has the knowledge and skill Faith needs to transform her house and the patience and tenderness to help restore her belief in herself as an attractive woman. Faith is not eager to become involved with Pavel. She is concerned about her children and their adjustment to the changes in their lives, and she becomes fascinated with the history of the house. It was from that house, about four decades earlier, that Faith’s older sister, Hope, was stolen. Her disappearance remains a mystery. Faith’s investigation into the house’s history uncovers troubling truths about her family. Prospect Street is the story of Faith’s journey to redefine herself and her relationships with her parents, her former husband, her children, the new man in her life, and the house on Prospect Street and the secrets it holds. Richards doesn’t vilify David Bronson, and she doesn’t turn Faith Bronson into a saint. He is the product of a conservative Christian upbringing and has spent his life denying his sexual preference. He is a flawed man, but he is a sympathetic character. Faith is filled with anger and resentment over the shambles of her life, but she gains strength as her self-knowledge and confidence increase. Their children are confused and troubled. Preteen son Alex is a bright, sweet child who forgives and accepts with little difficulty, but daughter Remy is transformed by the destruction of the life she has known, changing from a sunny-natured girl to a bitter, rebellious teen who refuses to see her father and constantly challenges her mother. 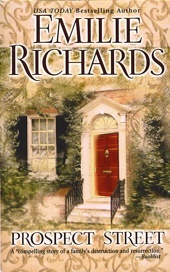 Richards does not use her novel to sell a political or religious (or anti-religious) message. She presents complex characters with messy lives who struggle to forgive and to grow. The ending may be a bit too easy for all this complexity, but the book is a fascinating, human story. Its themes of compassion and forgiveness will resonate with many readers. Emilie Richards is one of those writers that I have followed through several genres and enjoyed every part of the journey. I started reading her books when she was writing categories, and her Men of Midnight trilogy and The Trouble with Joe are still among my keepers. I’ve read all her single-titles from Iron Lace (1996) through The Swallow’s Nest (2017), including her Shenandoah Album books and her Ministry is Murder mysteries. But Prospect Street is the one I return to again and again. It is one of my all-time favorites, and I highly recommend it. This sounds like a very good story and I'm adding it to my ever growing wish list. Great review. Thanks for sharing! I haven't read any of her books. The fact that it is one of your all-time favorites certainly makes me want to read this one. Great review! I need to look this one up! I have read several of her books but I have missed this one. Will have to add this to my list. I hope you all will read it. Emilie Richards's name on the cover is almost a guarantee of a good read, but this one is special. Great review and it seems that I need to look for this book. Thank you so much for your comments on this book. I have read a few of her older books but not this one. I certainly sounds like a complex, interesting books dealing with life's challenges and people's responses to them.